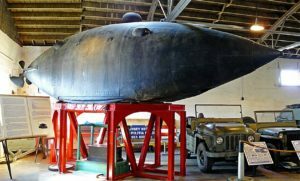 Intelligent Whale, an experimental hand-cranked submarine, was built on the design of Scovel Sturgis Merriam in 1863 by Augustus Price and Cornelius Scranton Bushnell. In 1864 the American Submarine Company was formed, taking over the interests of Bushnell and Price and there followed years of litigation over the ownership of the craft. When title was established by a court the submarine was sold on 29 October 1869 through a contract made by owner Oliver Halstead and Secretary of the Navy George M. Robeson to the United States Navy Department, with most of the price to be paid after successful trials. In September 1872 the first trial was held and was unsuccessful, whereupon the Department refused further payments and abandoned the project.